Thy rod and Thy coaching staff they comfort me. 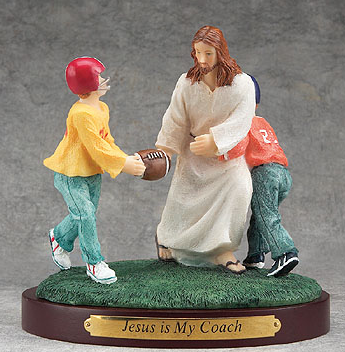 The relationship between faith and football is a funny thing, especially in Alabama. Whether it’s preachers who lose church member because they mentioned the game in a sermon, or lay people who came for Jesus and left for football, one thing is clear: faith and football dance a weird dance in this state. Attendance-wise, is there a bigger Fall weekend at a church in Alabama then the weekend Bama has a bye week and Auburn plays Southeastern Louisiana Technical School for the Arts, or vice versa? Know of many churches with Iron Bowl watching parties, trying to bring the two sides together on that day of war? Me neither. Learning you have an idol is a hard and funny thing, especially when it isn’t made of stone or wood. I may have learned that that’s what Auburn football was for me on September 20, 2008. I stooped down on the third row of end zone seats in the Auburn student section and wept, shaking with anger as the clock hit zero. Brandon LaFell was the demon, Les Miles his devil. Maybe I realized it was an idol when I ruined a perfectly good moral victory in the 2009 Iron Bowl by shouting down a teenage girl wearing more houndstooth than Bear Bryant ever did. I may have only been 18 but when you find yourself yelling at teenage girls over a football game, only one thought sticks with you: Never again. Please God, never again. God has a sense of humor, and he granted my request particularly quick this time. Only a God with a deep sense of irony would give Auburn a national championship the year I decide I’m going to ‘care less’ about football. Only a God with a sense of humor would do it the same year I got a job with the team. 2010 tested my commitment to not love football more than I should. 2011 made it easier. In 2012, I enrolled at the Southern Baptist Theological Seminary and the Lord saw to it that studying on Saturday’s would not be difficult. Every fan that is blessed with a 14-0 should also have to go through a 3-9. After a season like 2012, there wasn’t much to be expected. 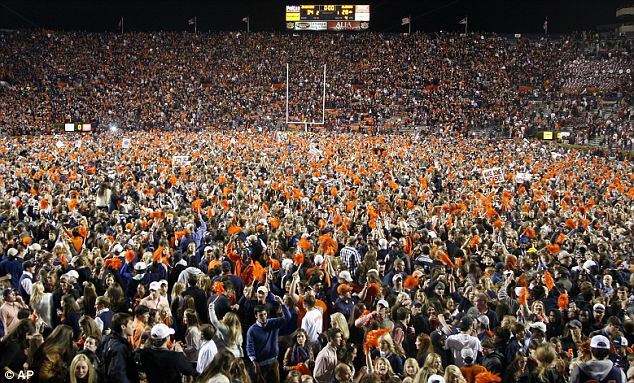 Even the most optimistic of Auburn fan’s could not have predicted what would happen in 2013. Chizik’s final campaign was a tour of misery. Players gave up. Fans gave up. The only thing that did not give up was opposing offenses. Every Auburn fan wanted to predict a championship— how could we not! But like the false prophet Balaam, when we open our mouths we could only speak the truth. Auburn would not win more than nine games, and that was extravagantly optimistic. How is it that Johnny Manziel can’t be stopped? He’s stayed on the ground more than Brodie Croyle and yet every time he gets up. What hope do you have if you hurt a guy’s shoulder and he gets up to throw a 40 yard pass? No hope. You just knew he was going to come back an beat us. Then, 22 yards behind the line of scrimmage, Dee Ford grabbed Manziel by the shoulder pads and said, “No.” “No” to losing. “No” to one more play on Johnny Manziel’s never ending highlight real. He said no to people’s expectations that Auburn couldn’t compete in the SEC in 2013. The “no” resonated throughout the hearts of the Auburn family. Faith was reborn. Maybe it was when Johnny Manziel hit the ground or maybe it was when Auburn decided passing the football against Tennessee was boring—regardless, the 2013 Auburn tigers went from Team of Mediocrity to Team of Destiny. Or did they? It seems built in to the idea of destiny that it is beyond our control. Do teams of destiny blow double digit leads to Georgia in the fourth quarter? Was it destiny that gave a questionable-at-best touchdown to Aaron Murray on the goal line? Was destiny repaying him for tears shed at the feet of Nick Fairley? Was it destiny that on fourth down made Sammie Coates invisible? And destiny who would underthrow a wobbly pass to the wrong man? Søren Kierkegaard has said, “The most painful state of being is remembering the future, particularly the one you’ll never have.” And so we were grieved at the loss of an impossible hope. As humans, we don’t merely lament death, we lament the dying. There in my living room, standing in front of the television, I began to pray. Why am I praying for a stupid football game? God doesn’t care about football! And yet, he cares about me. And he cares about what I care about. And so, because I know he cares and because I know he can do as he please, I began to pray. I prayed for consolation. I prayed to not sin. As that final throw rose, so our final hopes; as it drifted downward into the hands of devils in red and black, our sadness exceeded it and dreams of championship began to crash to the ground. The ground never came. The dreams—and more importantly, the ball—bounced. The ground never came—only the end zone. Ricardo Louis became a hero. The dreams became real again. I’m sorry to say that I don’t think God was rewarding my prayers. But I think he heard them. All things are to be received with thanksgiving. One frustrating night in Auburn, our boys lost the lead and lost hope. Somehow, interception became reception. I didn’t need to know why or how. But I did need to give thanks. Over the next month and a half, ‘destiny’ and thanksgiving intertwined. I cried after the Iron Bowl. Words failed for hours. Words were spoken, they were just insufficient. Elation rode in with the impossible. A miracle had felled Alabama. Desolation met Missouri. Somehow I knew we would win it all. When we grabbed the big lead, when Jameis kept hitting the ground, even when they got the fake punt, the game was ours. Teams of Destiny can’t be stopped after all. As the kick returner strolled into the end zone and Auburn finally lost the lead, I only felt peace. Perhaps no one had told the Seminoles, but they had told me: we were the Team of Destiny. As soon as they handed Tre the ball, I knew he was going to score. As he surged into the end zone, I knew that was it. Who needs destiny? We reached out and took it. Then they won it back. We lost. But we didn’t lose it all. There are those who get angry at the thought that God might be involved in the outcomes of sports, whether individual games or seasons. What a silly thought! God’s hand in sports, God’s hand in all of life, means that in every event, every game, every season, there is something to learn. There is opportunity for thankfulness. Looking back on the 2013 season, I’ll never be glad for the missed tackle late in the national championship game. I’ll never find a moment of happiness thinking about Jameis Winston’s late game TD. But 2013 was the year of Gus Malzahn’s return. 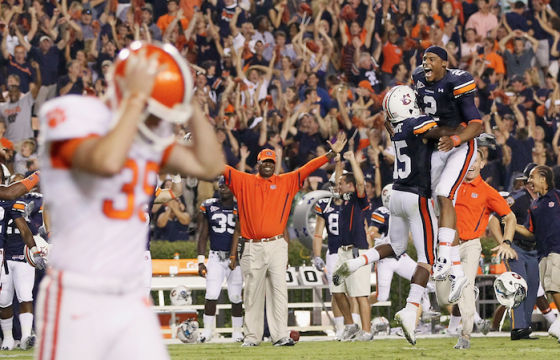 The year of The Prayer at Jordan-Hare and Kick Six. It was the year Tre Mason went off, and Chris Davis went into the history books. It was a year of redemption and a year of fun. 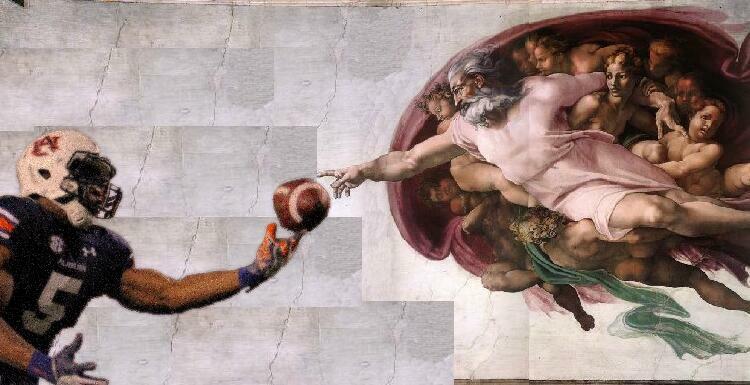 Is it even right to speak of football in terms of faith or prayer, blessing or providence? Let the theologians argue about if God caused it or if he just allowed it. I’m just thankful he let me experience it. Griffin Gulledge graduated from Auburn in 2012. A student at Beeson Divinity School at Samford University, his passions include Evangelical theology, Alabama Baptists, Braves baseball, and Auburn. He tweets about each in excess at @griffingulledge. Related: Is Aubie a Christian? Tubberville, as in, Tubberville was great but Chizik won it all. The context of the Bible passage helps. Did anyone else see that first picture and wonder how many pushups or windsprints Jesus gives you if you fumble the ball?